Has anybody disassembled/repaired one of these before that can advise or know where I can find a repair manual for same? I cannot find anything on the "net". Note: Bought the lens for the equivalent of about $20 so do not want to spend more than I paid for it to have it professionally repaired. @DCShooter - Brian do you have any ideas? I love trying out older lenses on my various Pentax bodies. Since you paid $20 for this lens and it was originally intended for a full frame camera, if you are using it on an APS-C body, the issues on the edge of the lens -- as you illustrated -- will very, very likely have zero effect on your images. Unless there is hazing across the center of the elements, ignore the issue? I'm not sure if you access the remainder of the elements through the front (you'll likely need a spanner wrench to unscrew an internal slotted ring if so, similar to something like this.... Amazon.com : Neewer Professional Flat & pointed Tips DSLR Camera Lens Spanner Wrench Repairing Opening Tool for Most Cameras : Camera & Photo). OR, the rest of the elements are reached by disassembling the rear of the lens. Likely there are set screws which hold rings in place which unscrew, but be careful of the aperture blades. OR, (sorry, I haven't taken apart that specific one), you will have to remove screws from the focus ring, remove it, unscrew the helicoid... the lens comes apart in the middle...., then it's a bit complex to get it all back just right and properly adjusted for infinity focus. For $20, using on a crop-sensor camera, just use as is and the defects likely have no effect on your images. The tools alone are more than the cost of the lens. Last edited by yucatanPentax; 12-20-2016 at 04:13 PM. Thanks for your response and general directions on disassembly of "similar" or same era lenses, yucatanPentax. Like you, I enjoy using these older, manual lenses on my K-50 and have a couple of Takumar primes as well. This Komura is a well-constructed, solid lens and stopped down to f8 produces nice, sharp images. Wide open at f3.5 and also at f4 and f5.6 the images are in my opinion excessively soft. Even though fixing the mentioned issues may or may not improve it's performance, I would still like to restore this oldie to as close to it's original condition as I can. Valuable information and advise about disassembly and repairs on this lens, DCshooter; many thanks! I have some other old lenses that also need attention so I've invested in the necessary tools. 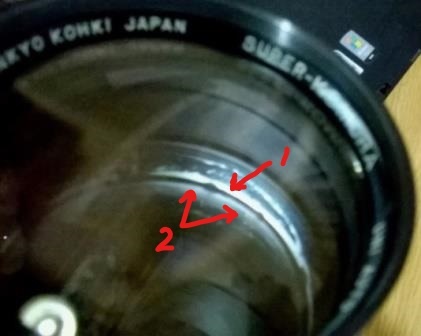 I doubt that it is "schneideritis", but some paint has certainly come off the inside of the tube/ring containing the second element, in front of as well as behind the lens. 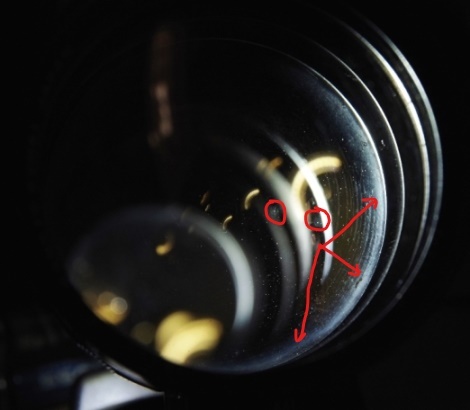 Attached a picture with light from the rear of the lens that may give you a better idea of the white "haze" along the outer edge of the lens (indicated with arrows). Circled in the picture are two fungus spots that I also want to address at the same time. The support from yourself and yucatanPENTAX just emphasized the spirit and attitude of members of this forum! Update on this issue. Armed with tips and advice received here, I managed to disassemble and clean the lens properly. The main issue turned out to be "scneideritis?" on the third lens element as @dcshooter suggested. The flaking paint was removed and the edges repainted with a sharpie. Like they say: "The proof of the pudding lies in the eating." I am well satisfied with the results and the fact that this "oldie" can once again perform to its potential. Thank you for the update. I was wondering how it all went. Seems the images turned out well too. Thanks! All times are GMT -7. The time now is 02:10 AM. | See also: NikonForums.com, CanonForums.com part of our network of photo forums!